A threatening letter sent to the home of Sen. Susan Collins (R., Maine) specifically mentioned her vote to confirm Supreme Court Justice Brett Kavanaugh, according to her husband, Thomas Daffron. Daffron, who opened the letter on Monday, said the writer claimed the note was tainted with poisonous ricin residue, the Bangor Daily News reported. The letter was addressed to Daffron, but contained anger directed at his wife. After receiving the letter, he put it in a plastic envelope and called the police. Law enforcement is still investigating the source of the letter. 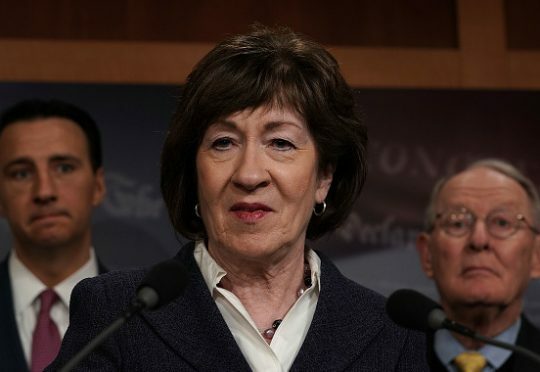 Collins was able to spend Monday night at her residence in Bangor, Maine, after preliminary tests showed no public threat. Earlier this month, Collins voted to confirm Kavanaugh to the Supreme Court. During the confirmation process, the Maine senator and her staff were pressured by liberal activists to vote against the nominee. Her office received profanity-laced emails and letters, as well as threats. The suspicious letter sent to Collins' husband comes as several prominent Democrats have questioned the value of civility in the current political climate. Twice-failed presidential candidate Hillary Clinton told CNN's Christiane Amanpour that "civility can start again" if the Democrats retake control of Congress. Former Attorney General Eric Holder challenged former First Lady Michelle Obama's motto, "When they go low, we go high" while campaigning for Democrats in Georgia. "When they go low, we kick them," he said. At a rally in June, Rep. Maxine Waters (D., Calif.) endorsed publicly harassing Trump administration officials, encouraging people to "create a crowd" around any they see and tell them they are "not welcome." Last month, Sen. Ted Cruz (R., Texas) and his wife, Heidi, were harassed and forced out of a restaurant in Washington, D.C. by protesters. This entry was posted in Politics and tagged Brett Kavanaugh, Eric Holder, Hillary Clinton, Maxine Waters, Susan Collins, Ted Cruz. Bookmark the permalink.